The main wheels have been set inside the main frame so they do not obstruct the delivery swing. 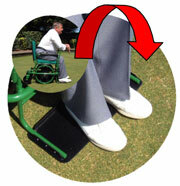 The seat is so low that delivery is always low so there is no danger of dropped woods damaging the green. 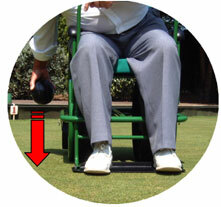 When leaning forward to rest or to bowl the weight is transferred from the front leaning bar down to the footrest. The footrest has an area much greater than feet and lies flush with the ground. There are no small wheels to dig in. The footrest anchors to the ground so well because of its large area no brakes are needed, not even when firing! Making alignment fuss free. The machine can be dismantled simply and in seconds. 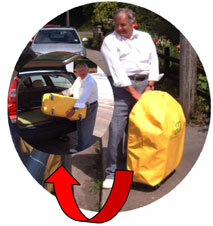 It packs into a transporter bag which is set on casters to enable easy delivery to the car or storage area. It is so easy that many people require no assistance.